Elsie M. Campbell and Aunt Mimi's Quiltworks: Love Knows No Season pattern for Valentine's Day! 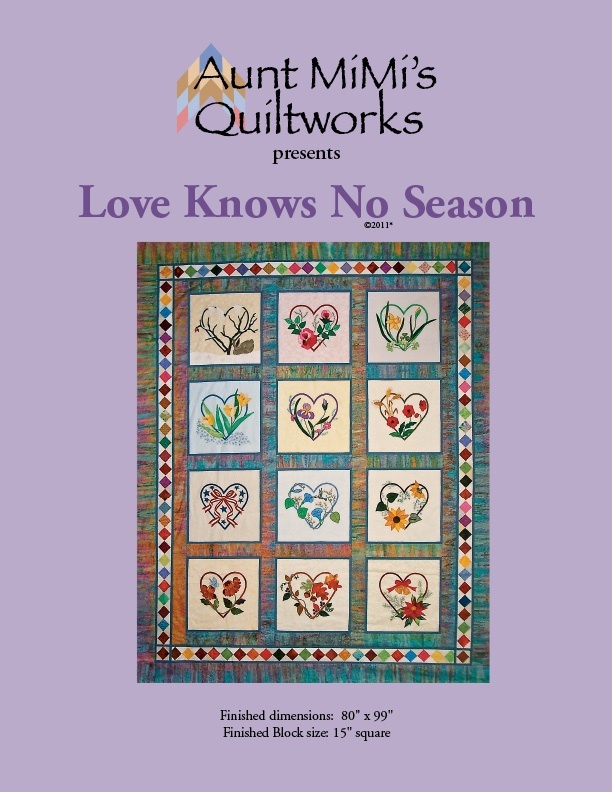 Love Knows No Season pattern for Valentine's Day! Valentine's Day seems the perfect time to introduce my new pattern for the Love Knows No Season quilt, given the subject and title of this quilt, don't you think? So, beginning on Monday February 14, 2011 (Yes, next Monday!) the complete pattern will be available on my website. This pattern includes all 13 block designs printed on oversized sheets of paper, so they are complete, and full-sized. No taping of smaller pages together, or tracing to make a full-sized pattern required. All 13 designs are there, even the July alternate geranium pattern. The 16-page instruction booklet includes borders, and sashing construction measurements and directions, computer-generated diagrams, and close-up, full-color vignettes of the blocks. All this for $19.95. But for 2 weeks, beginning on Valentine's Day, you can get a 15% discount for a total of $16.96. This promotional price will disappear on March 1, 2011, so be sure to get your order in early. Patterns will ship on or about March 1. This Block-of-the-Month project proved to be one of the most exciting things I've ever put together. Hits on my website came from nearly every country on this earth, and the compliments that arrived in my e-mail inbox were amazing. Thanks to each and every one of you out there who faithfully visited my website to download the patterns. But some of you may have missed out. I'm still getting requests from people for these patterns, so here they are! How many different ways can you think of to use these designs? How about making a wall quilt background, and little individual quilts featuring each block, then adding velcro so that you can attach the little quilt to the background quilt? You can change the block/quilt for each month of the year, for a kind of calendar quilt. Or how about individual throw pillow covers that can be changed with the seasons? Any other ideas out there? Thanks again to all my followers for making the project such a big success. Be sure to check my website beginning Monday for the pre-release sale! I got ALL 12 blocks finished and did some bead embellishment on a few. Now I have to put the top together. Mary, you are absolutely amazing! I can hardly wait to see it. Now, I would you spread the word about the availability of the pattern when you show off your quilt? Thanks so much for your interest in this project. I missed getting the pattern when you did your BOM, but I am glad to be able to buy it from you. Thanks for the chance and the discount.